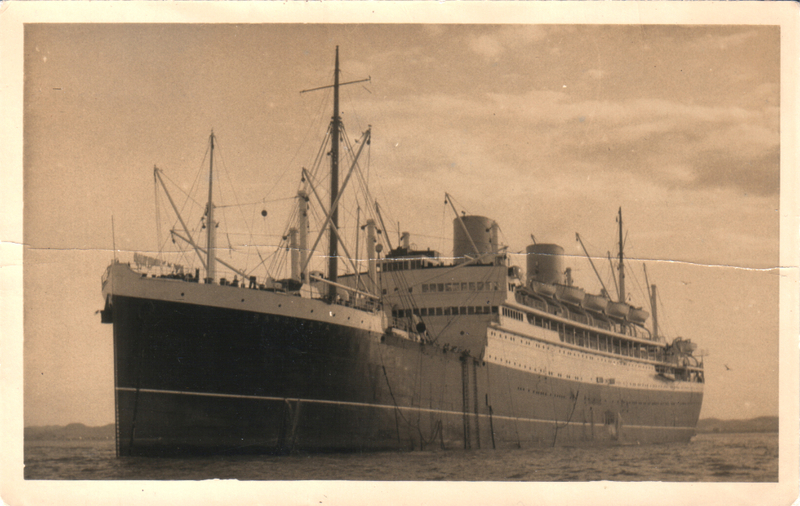 This photograph of the SS Rangitata is a recent addition to my collection. I certainly didn’t buy it for the condition because it has a rather nasty crease all the way across the centre, but for the rather nice message on the back, and also because the style of the back is the same as that often used in my study of “HGK”* postcards. This would appear to be a very slight variation on back style “G” without the publisher overprint on the left hand side, and with the slight difference of a small dot printed between the words “POST” and “CARD”. Perhaps this is an earlier printing of the back, with later printings losing the dot? *The initials “HGK” stand for Henry George Keyse. According to my research, Henry, a barber working for the New Zealand Shipping Company, was on board the Rangitata for at least three voyages in 1940. I have not been able to find any records of his voyages during 1941 or 1942, but in 1943 he was aboard the Rangitata on the voyage from Gibraltar to New York, still working as a barber (and photographer), aged 62. At this time he had been working at sea for 37 years. 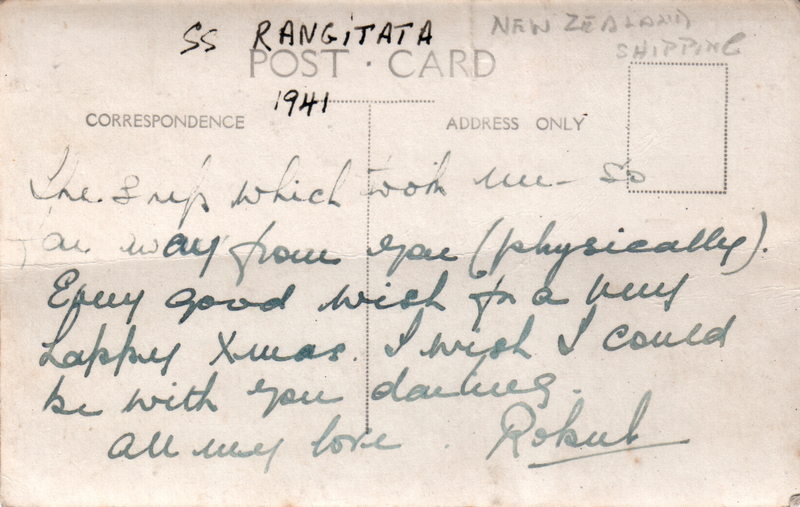 I am assuming that this postcard was bought on board the Rangitata from Henry’s barber shop (which also sold souvenirs), and that the photograph was taken and printed up by him on pre-printed postcard photographic paper. This entry was posted in Rangitata on 17/02/2018 by printerspie. The latest passenger list to be added to this website is for the Rangitata‘s voyage to New Zealand on 24th February, 1950 (you can access this from the drop down “Passenger Lists” menu at the top of this page). 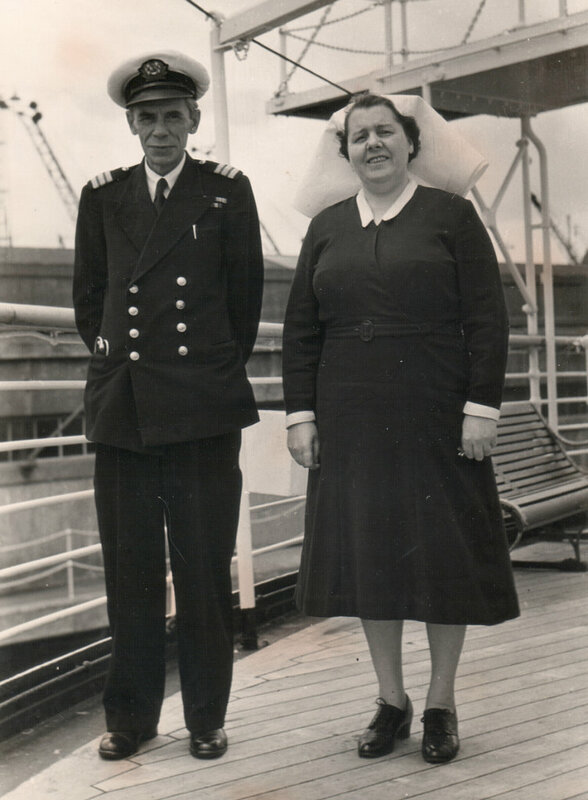 The photograph here shows Nursing Sister, Enid Jones, who made many voyages on the Rangitata from 1946 to 1957. I’m not sure who the man on her left is, but at a guess, he could be Surgeon, J. M. Pinkerton (note the stethoscope in his pocket). One of the passengers on the 1950 voyage was Adrian Hobbs, assistant secretary to the High Commissioner for the Western Pacific. He was collected at Pitcairn Island following his month long visit after delivering the restored bible from HMS Bounty – read more. 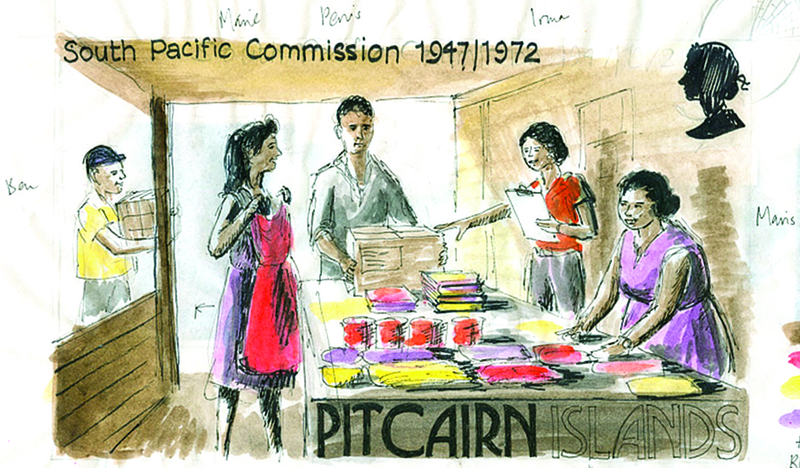 This entry was posted in History, Pitcairn, Rangitata on 16/08/2017 by printerspie. Michael Foot contacted me last year to let me know about his fantastic collection of photographs, most of which were probably taken on board the SS Rimutaka. The photographs shown here are very old, quite faded and marked, but he has managed to adjust them a little, and has given me permission to reproduce them. Michael said that the photographs were discovered when his grandmother passed away. He believes there is a family connection, but has not found it yet. The Rimutaka (1900-1930) had a crew of 90. She could carry 40 first class passengers on the bridge deck, 50 second (upper deck), 80 third (upper deck), and 170 emigrants located in dormitories erected in the holds. Source: Merchant Fleets, New Zealand Shipping and Federal S.N. Co. by Duncan Haws. 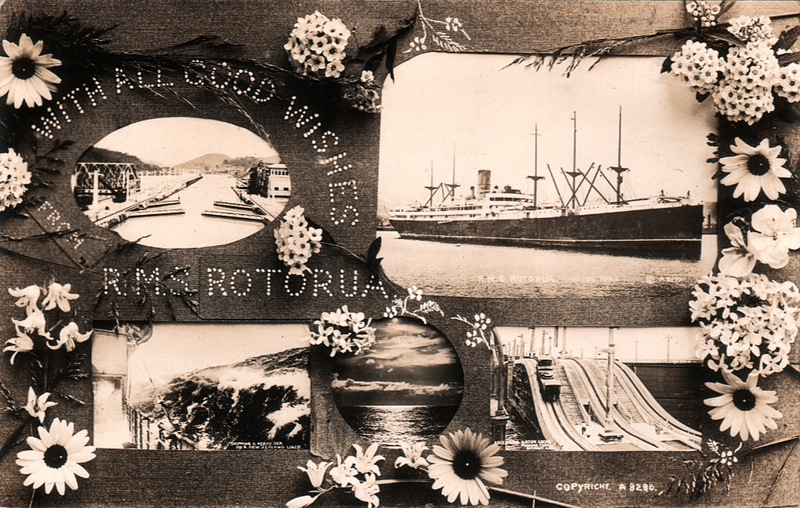 This entry was posted in History, Rimutaka and tagged postcard, Rimutaka on 21/07/2017 by printerspie. A list of passengers travelling on the 3rd May, 1884 voyage of the Tongariro has just been added here, thanks to a listing on eBay. 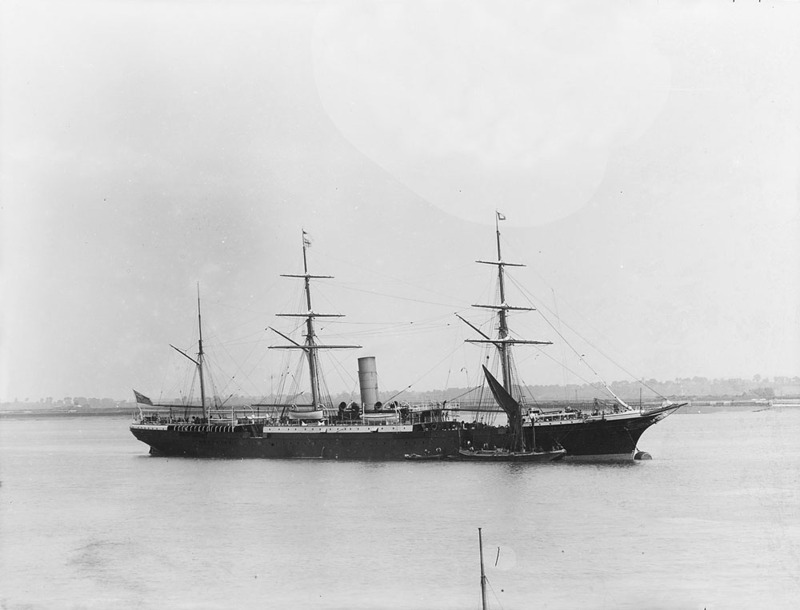 The Tongariro was launched on 23rd August, 1883. In the book Crossed Flags (ISBN 0 905617 87 8), it states that she could carry 64 first class passengers, 36 second class, and 250 in steerage. All 64 first class tickets were sold out for this voyage. She also had refrigerated space for no less than 27,000 carcasses! Steamship Tongariro. Photo: National Maritime Museum, Greenwich, released into the public domain. This entry was posted in Tongariro on 29/03/2017 by printerspie.